Candy is loaded with sugar, empty calories,* and preservatives. Don’t use Halloween, or any other holiday, for that matter, to stuff your mouth with unhealthy food that isn’t necessary for human health. Sugary food gives you a rush of energy, and then lets you down, so you’ll go looking for more. If you have kids, or expect kids to come to your door on October 31, give them something else. Kids don’t need candy. It ruins their teeth, and makes them fat. Read more about Halloween candy no-no’s for kids, at Healthfinder.gov. *Click here for an explanation of empty calories. 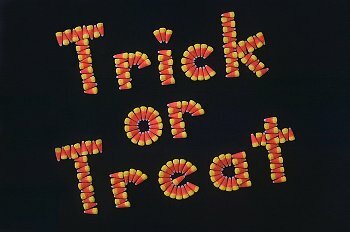 Posted on October 12, 2012, in Food and tagged Halloween candy, Halloween candy alternatives, Sugar, trick or treat. Bookmark the permalink. Leave a comment.